A black and white large format negative of Stuart and Muriel Crago and their wedding party taken outside of a car on July 27, 1946 in Brooklin, Ontario. In this from left to right: unidentified man, Stuart Crago, Muriel Harding Crago, unidentified woman, unidentified woman and unidentified man. This negative has started to degrade. Stuart Crago married Muriel Harding on July 27, 1946 in Brooklin, Ontario. 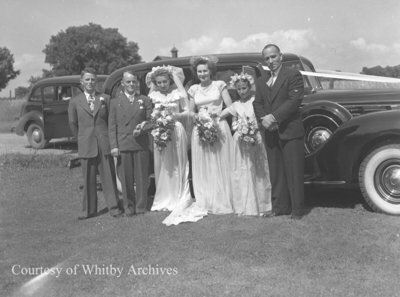 Crago Wedding, July 27, 1946, Marjorie Ruddy. Whitby Archives A2013_040_587.